Spring means that my unpacked box of warm-weather clothes yielded an awesome new wardrobe that I'm just now rediscovering. In the past, beautiful week at work, I've started to reincorporate those tank tops and flimsier pieces into my work attire. The clothing item I am happiest to revisit? The knee-length and midi skirts! I think that these are ultra-flattering skirts and lend themselves well to any type of shoe choice (heels and flats and boots if you're brave). One thing to watch for with the midi is that if you're shorter, they could fall at the wrong place on your leg. They should be landing below the knee, but not so far down the calf that they look like a too-short maxi. Try looking for a skirt that was meant to be knee-length but instead falls a bit longer on you and you'll be set. I love this midi from Asos. It's crisp, white, less prone to wrinkles that some of my other pieces and it pairs with everything. For the first look I avoided looking Halloween in the first by breaking up the black heels and the orange top with the midi. The second was learning toward circus, but the simple heel helped solve any silly connotations with the look. If I had a crop top I'd rather pair it with this skirt as it is a bit see through and tucking my tank in is always a bit iffy. Check out the original post here (first image) and the original post for the second image. This skirt is one of my favorite full, knee-length pieces. It reminds me of a different era and I always feel like I should be going out to some kind of dance hall with my beau when I wear it. I love that it works just as well with flats as it does with heels. In order to pair tops with a bold skirt like this, I usually go for a solid color, like a short-sleeve green sweater, white button-down, or a plain chiffon long-sleeve top. Check out the original post! And finally, this Forever 21 skirt has gotten more mileage than anything from F21 should rightfully have. I bought it sometime in the last two years and have paired it with quite possibly everything in my closer. Two favorite looks are shown here that show it paired with a sweater for the colder and earlier days of spring (I tuck a high-low sweater into it and leave it blousey) and a tank top that's perfect for hot days. This skirt is breezy and airy and keeps you cool on the hottest days. Another key about this style of skirt is that the light color can cause your waist to lose definition, so I always accent it with a dark colored belt! Check out the first image original post and the second original post. Here are some of my favorite midi and knee-length skirts from Asos and Nordstrom. You are a pro at styling the midi skirt! This post really makes me want to buy more! First and last outfit are my favourite ones! Love your style! Love these kinds of skirts! Girly, but comfortable and easy. I love the shoes in look one. Where are they from? I'm always a little scared of below-the-knee skirts; I always feel a little frumpy, or overdressed, or something. But all of yours are so lovely, and you wear them beautifully. I'm inspired to try and introduce some into my wardrobe this summer! I love midi and knee-length skirts as well; they're great for bike riding! I love the white ASOS skirt on you especially; so flattering. I haven't pulled out my spring/summer clothes yet, but I hope to do it this weekend. This skirt length looks incredible on you! I can do knee length, but anything longer (besides maxi) is tough for me because of my short legs! But you can wear anything! Loving how this skirt length looks on you! I love midi skirts because I am a child and I love spinning around in them. Yes, I am 5.
love these! 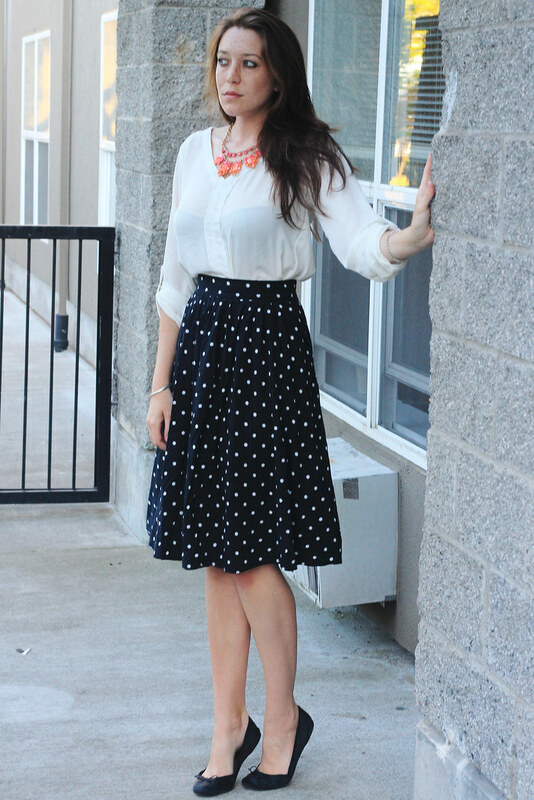 the polka dot and forever 21 skirts are my faves. You look so elegant! I'm afraid of the midi since I'm petite, but I'm seeing the awesome length everywhere and really need to give it a try! Lovely outfits. Your skirts are so pretty and classic. Lovely ladylike outfits! Love the black knee-length skirt. Def my fav! That white midi skirt is gorge! What a feminine silhouette! I just had to show this post with the Killin it post to convince my husband that I could wear a more casual (still not a t shirt) shirt with my pink lace midi skirt. I think I confused him about women's fashion more than ever. So, thank you! !